WARNING: DON'T TRY CUSTOM FIRMWARES UNLESS YOU KNOW WHAT YOU ARE DOING, YOU COULD DESTROY YOUR UNIT BY DOING THIS! I'M NOT RESPONSIBLE TO ANY DAMAGE CAUSED TO YOUR UNIT BY USING IT! USE ON YOUR OWN RISK! To reset username/password you've to reset to defaults using a RESET/RESTORE button! This firmware contains feature appeared in the 1.7.5.9-1: it's now possible to completely customize your boot scripts using the "local" pseudo file system. It's built on top of ramfs and 64k flash space introduced in the 1.7.5.6 custom firmwares. The idea is as follows: once you've made the changes to the ramfs system (/usr/local/ now also mapped to ramfs, you need to launch special command to store modified files permanently in the flash. During the next boot wl500g will extract these files for you. So, you can store whatever you need just like in real non-volatile file system. Consider using /usr/local/etc for files which is normally resides in /etc, /usr/local/sbin for "ASUS style" init scripts and /usr/local/sbin for executables files/scripts (it's now added to the default PATH). calls &qout;flashfs start&qout; which compares boot_local nvram variable content with current version number (now stored in the file named .version) and if they matches, then extracts "local" pseudo file system from flash. This measure was taken to prevent data prepared for one firmware to run after the firmware upgrade. You need to explicitly enable boot_local in this case (see below). You can also put remount command to the post-boot script. Since 1.7.5.6-2 ASUS supplied printing solution was replaced with p910nd daemon which implements Raw port printning with Socket API protocol (also known as HP JetDirect). In order to use new printing facility from Windows you will need to change the port seetings to use "Raw" protocol instead of "LPR" and specify port number for the port. 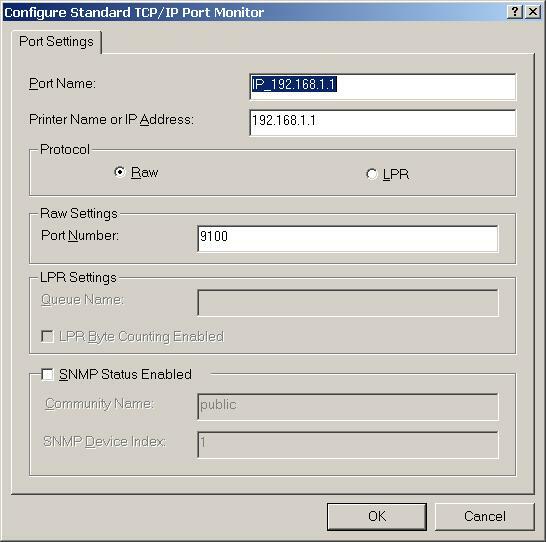 Since 1.8.1.7-1 port numbers are changed to be wl-500gx comaptible: use 9100 for printer connected to the USB port or 9101 for LPT connection. Please note, it's now possible to use two printers at the same time. The port settings dialog should look like the following: Complete Windows 2000 printing how-to is available here. Starting with 1.7.5.9-4 there is a QoS support compiled into the kernel. Wondershaper script is called /sbin/wshaper, and should be started as follows (play with download & upload values to find optimal one, they should be something lesser than your modem/isp speed). This should produce number of strings saying "patching file bla-bla-bla" and no error messages. If you got errors then check your kernel source tree. Original firmware are supposed to be build in the router directory, custom firmware makes parallel directory called gateway (in the src dir). So, prepare it just type make in the wl500g-1.8.1.7-1 directory. Jump to the src/gateway and type make. This should start compiling. If everything is went well type make install and it should produce file named mipsel-uclibc/linux.trx which is your new firmware. Toolchain sources are available here. Grab them if you want to build it yourself. You will need to extract sources, apply patches, copy config and build it using "make oldconfig all install CROSS=mipsel-linux-". Your millage could vary, as I'm typing this from the memory. No longer availbale for download. Changes: this is a bug fix release. Dropbear was inoperational in the 1.8.1.7-2.
wan0_pppoe_maxfail - terminate after wan0_pppoe_maxfail consecutive failed connection attempts. A value of 0 means no limit. The default value is 10.
wan0_pppoe_holdoff - specifies how many seconds to wait before re-initiating the link after it terminates. Fixed PPPoE connection issues - moved to ppp-2.4.2. Added experimental support for MPPE over PPTP connections. Added support for system shutdown - press RESTORE/RESET button until power led turns off completely and release it, your unit should go "down" in several seconds. Use halt from the command line to do the same. No longer available for download, use 1.9.2.7-5a. Fixed WPA not working bug, and changed WAN port dies workaround to safer one. Rolled back to busybox-1.01. Added http_lanport patch (credits to Leon Kos), SoundBlaster Audigy 2 NX soundcard support (credits to Daniel Pustka) and enabled irq sharing for the serial ports. WL500g Premium support (MirrorBit Flash support, nvram validation, 32mb enabled) !!! The firmware is totally different from the stock one: no DM, different FTP server and Samba! Do not flash if in doubt - you would miss some features !!! Enabled Idle Disconnect functionality for PPPoE/PPTP. It's recomended to turn this feature off by typing zero in this field. Added fine grained WPA control on the Wireless page: added separate WPA Enterprise, WPA2 Enterprise, WPA Personal, WPA2 Personal and WPA-Auto-Personal (which is wpa-psk + wpa2-psk for TKIP+AES, wpa-psk for TKIP and wpa2-psk for AES). Added Regulatory Mode field (802.11d/802.11h/off) to the Wireless - Advanced page. This should fix some problems with Intel WiFi cards (select 802.11d mode). Virtual Servers has now separate default action in the WAN to LAN firewall. Added Host Name field to the Manual DHCP MAC list. Added Comment field to Wireless - Access list. FTP: switched to vsftpd, reworked web-iface. Samba: extended web-iface, new share modes - all partitions, manual share list. Added utf8 as default encoding of the hard/flash drive (enabled by default). Added modprobe, which is looking for /opt/lib/modules/... by default. Added /usr/local/sbin/pre-mount to be called before automount (suitable to manual mounts, disk checks, etc). Windows XP users: check this MS KB 893357 article if you've delays/problems with WiFi connection.